Liquid food and alcoholic beverage suction and discharge (up to 95 proof). Versatile hose for applications requiring superb flexibility and light weight, while still maintaining high strength and durability. Tube - White Chlorobutyl meeting 3A (18-03) and FDA requirements. Reinforcement - High tensile textile cords with specially designed embedded helix wires..
Cover - Red smooth NR/EPDM blend for abrasion and ozone resistance. Extreme Flexibility – Uniquely designed for maximum flexibility, bends easily around brewery equipment and works well in tight spaces. 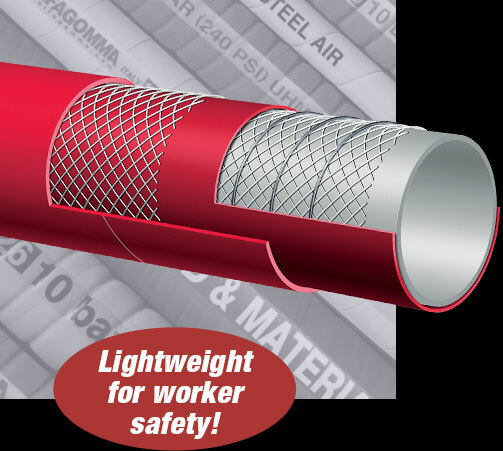 Lightweight – Up to 30% lighter weight than similar rubber hoses, while still maintaining 150 PSI working pressure. High Heat Resistance - Chlorobutyl tube capable of handling +226°F (+108°C) on a continuous basis. Allows for sterilization with +266°F (+130°C) steam for 30 minutes or with 5% soda solution. High Purity Tube - Will not impart odor or taste. Smooth Cover – Designed for easy cleaning, no gaps or crevices for dirt or bacteria to hide. Also provides a smooth surface for clamping. CONSULT FOOD HOSE GUIDE IN THE ALFAGOMMA INDUSTRIAL RUBBER HOSES BY KURIYAMA CATALOG FOR MATERIAL COMPATIBILITY ON PAGE 36.